This week has been yet another busy week for us. In fact, this winter is looking like it is going to be a busy one if the current rate of casualties continues. We already have over 80 hedgehogs in care and are expecting to over winter at least 120 hedgehogs found too small to hibernate. Each hedgehog costs on average £130 to over winter. To help pay the cost of looking after and treating these hedgehogs East Sussex Wildlife Rescue & Ambulance Service are holding a Christmas Craft Fair at East Dean Village Hall, Village Green Lane, off Gilberts Drive, East Dean, Eastbourne, East Sussex, BN20 0DJ, to raise vital funds for their cause on Saturday 3rd December 2016 between 2pm and 5pm. There will be various craft stalls including a lady who sells hand painted pebbles, glass painting, handmade candles, cakes, wildlife photography, gift hampers, hand sewn keyrings, cards, paintings, Christmas decorations, knitting, bath bombs and a various other arts and craft stalls plus a WRAS merchandise stall and one by Bird Aid. There will also be refreshments available too. Last year the event was a great success. This year we need as many people to come along as possible, pick up a few extra Christmas gifts, and to help raise the much-needed funds to cover the costs of what is already turning out to be a busy hedgehog winter. We are getting up to 5 hedgehogs being admitted each day, found out during the day time, most of the underweight, too small to hibernate, or suffering from injuries primarily after being caught in netting, picked up by dogs or hit by cars. Hedgehogs are thought to be declining by 5% each year. East Sussex has a number of areas where hedgehogs are doing really well and other where they are almost non-existent. 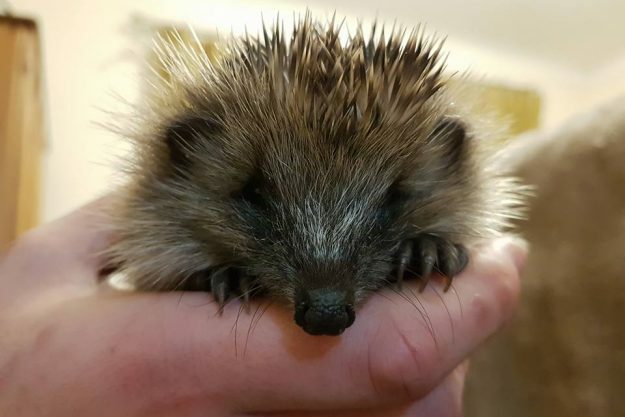 WRAS deals with 400-500 hedgehogs every year of which the majority of them are successfully treated and returned back into their home range helping to keep populations going. Our vet Mike has been called to dealt with a hedgehog found near Morrisions Eastbourne after being found by WRAS rescuer Karen Francis. She rushed it straight to Mike for treatment as a leg was almost hanging off. Our vet tidied the leg and once the infection is cleared we will look at having the rest of the leg amputated. Thank you the staff at Sharnfolds Farm near Hailsham for the help in releasing our road casualty moorhen which was found close by on Ersham Road. 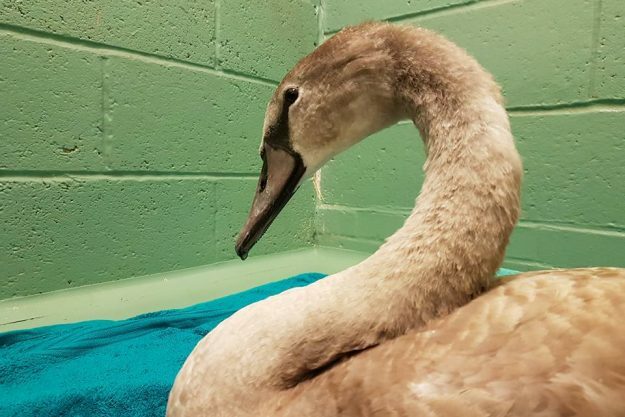 Another of the Decoy Pond cygnets has died, although it is unclear why. The other two have been caught and assessed and are a good weight, as was the swan which died when it was last caught. One of the cygnets had to be rescued and checked over after becoming trapped behind some fencing. Initially thought to be injured the cygnet was luckily ok and quickly returned to his defensive parents. Ambulances have been out dealing with a hedgehog at Grove Hill Hellingly found out in the day, a hedgehog curled up in the middle of a lawn in Hambleton Close Langney which was rushed to the vets due to a nasty infected rear leg injury, a hedgehog at Ringmer was delivered to our Casualty Centre after being found out during the day. A gull was picked up from Hawth Park Road Seaford after being found grounded at 2am after taking their dog out for a walk. Rescuers Kai rushed to a hedgehog at Queens Road Lewes after being attacked by a dog last week. The hedgehog has received emergency first aid and treatment. 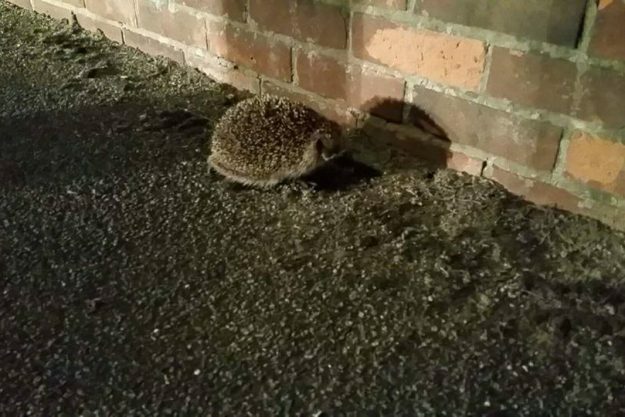 Two hedgehogs have also been released one at Five Ashdown, Peacehaven, Lower Dicker, Seaford and Eastbourne. Centre manager Chris and his partner Laura were out having an evening stroll and came across a hedgehog in the grass. Chris went to check his weight and give the once over and found a nasty infected ear and wound to the face, so he is also in care being treated. Our Hospital is full to bursting at the moment, and Christmas is not far away now, so why not send them a gift this Christmas! WRAS has a wish list with small items like food bowls to more expensive rescue equipment. The wild animals and birds we deal with can't say thank you but we can, thank you very much for supporting WRAS. Other calls this week have included a road casualty badger on the A21 in Hastings. An injured fox in the middle of the A259 near Bexhill. Sussex Police called out WRAS around 1am to check on a dead fallow deer with what was thought to be a baby lying next to it on the Heathfield to Tunbridge Wells Road, when I arrived it was found to be a fox savaging for food. 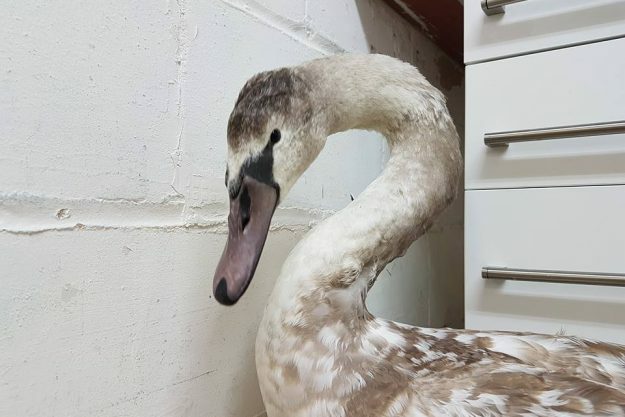 There has also been a swan rescued in Coldfield Walk, Eastbourne. Tony rushed to the scene and after a struggle got hold of the feisty swan. Back at the centre, he was given a once over and some wounds were found on his foot. They have now been cleaned and he has been bedded down.